Comments Marine treasures are fascinating. It has many secrets lying hidden in its belly and when it does throw open, the doors to its treasures, you can all but watch dumbstruck in wonder! Featured today is a completely natural and organic red coral of 4.23 carats set in Sterling silver as a Mars Talisman ring. The Red Coral is of Italian origin. The oval cabochon has a smooth blemish free surface and the finest robust Mediterranean Ox blood color. 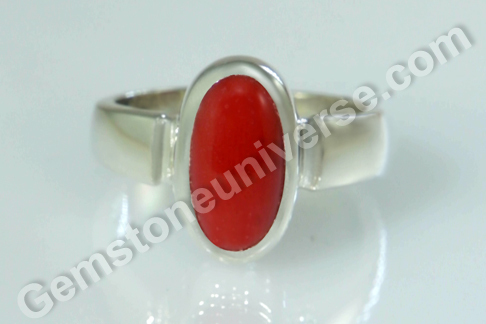 Red Coral is an opaque organic gemstone. Red Coral is also known as Pravaal/ moonga stone and is the gemstone of the fiery planet Mars/ Kuja/ Anagaraka/ Mangal. Natural and Red Coral set in a talisman can help harness the energies of Mars. An individual must be very careful while scouring the markets for original and untreated red coral. Click here: A Must read resource for the intelligent Coral buyer. Comments Life gets a new dimension when there is a dash of adventure, when there is openness to new experience and acceptance of everything that the creation has created. And there are ways to remove the blocks that stand in the way. The question is are you ready for it? Featured today is one such key to the portal called ‘self’. 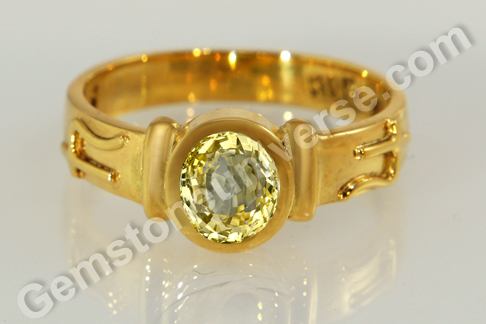 Fully natural and unheated Ceylon Yellow sapphire of 2.05 set in 22 karat gold as a Jupiter talisman ring. 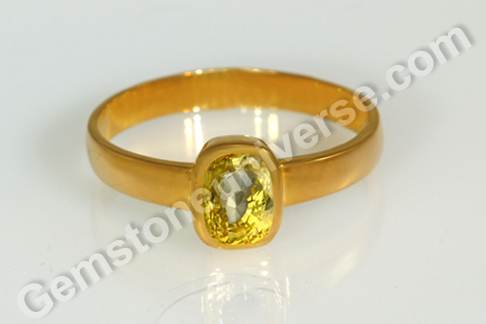 The oval cut yellow sapphire has a rich canary yellow color and superb lustre & brilliance. Note that the symbol of Jupiter stands in relief on the shanks. 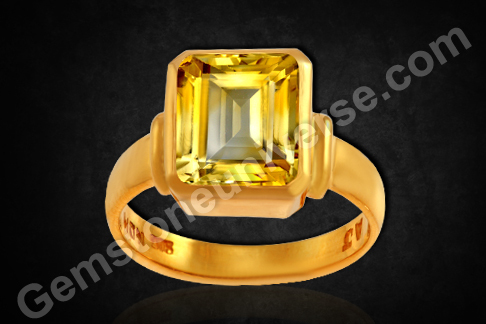 In Vedic Astrology or Jyotish, natural yellow sapphire or Pukhraj stone is the gem of Jupiter/ Guru/ Brihaspati and is used in a talisman to harness energies of this planet. And with the wisdom and the powers of Jupiter playing richly in your life, the journey to unfolding of ‘self’ and its true potential only gets better. 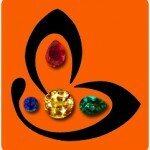 An individual can use planetary gem therapy to touch the frontiers of one’s potential that one thought did not exist. Welcome to the world of fascinating gemstones. Get yours and enjoy the joy ride! Featured today is a magical piece of creation, vouching for the immense prowess of nature – a fantastic oval cut Ceylon blue sapphire of 3.02 carats from the Nivitigala Mine, set in Sterling silver as a Saturn ring. 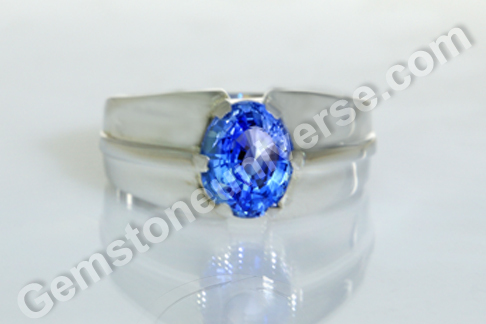 The completely natural and unheated blue sapphire has excellent clarity and has an enchanting deep royal blue color. Blue sapphire or neelam stone is the gem of lord Saturn or Shanidev and is used to harness the saatvik powers of Saturn and initiate positive transformation in life. It is a very powerful gem and displays its effects quite tangibly and quickly. 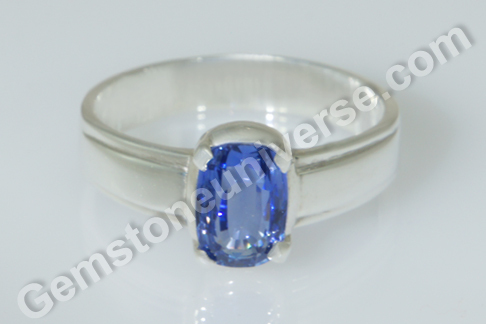 Planetary gem therapy with natural blue sapphire brings in very powerful results. Many patrons have experienced the benefits of blue sapphire and you can read the testimonials by clicking here. 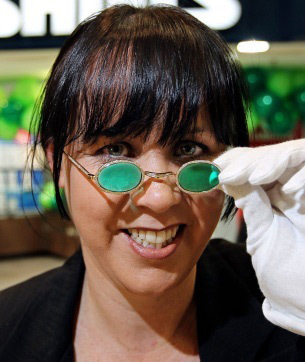 Such is the natural Colombian emerald featured today. 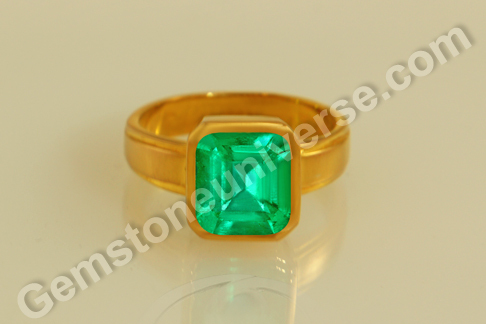 A stunner at 1.96 carats, the beautiful summer grass green colored Colombian emerald is fully natural and free of any treatment. The gem has been set in 22 karat gold as a Mercury talisman. 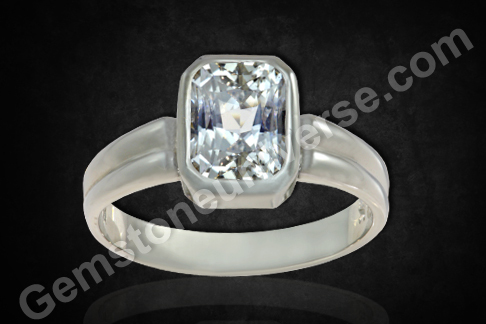 This bijou is a classic emerald step cut and has an unmistakable presence despite the minimalist design. 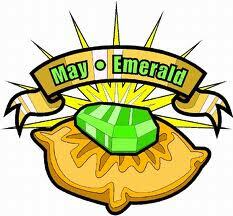 Emerald or panna is the gemstone of planet Mercury/ Budh/ Budha. Mercury governs commerce, trade, information exchange, communication, intelligence, speech, and intuition. 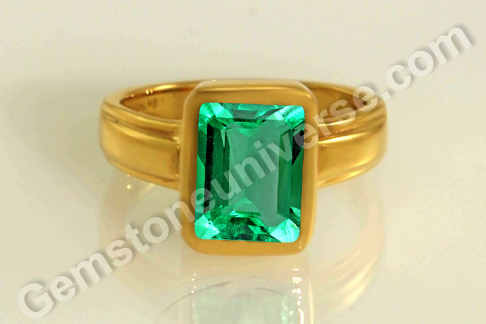 The natural emerald represents hope and fertility, surely due to its vibrant green color. 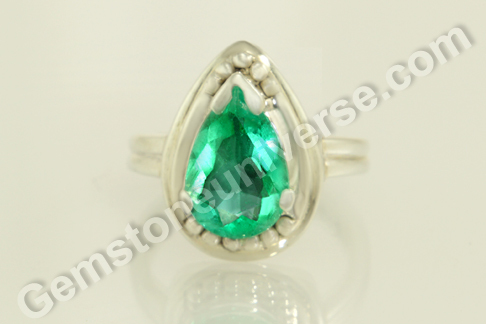 There are many metaphysical properties of emerald and it is used to heighten perception, to sharpen psychic awareness, balance mood swings, help in cases of insomnia, increase the bliss in marital life and for academic excellence also. shall be a loved and loving wife. So dear ladies, do go ahead and browse, for who knows you might find your lucky charm here!